If you’re running non-stock tires, our Speedometer Calibrator can correct the speedometer and odometer for tires up to 54 inches (for most applications). This device is engineered for the speedometer recalibration functions of the Max Energy Programmer, but without the additional expense of the other tuning features. 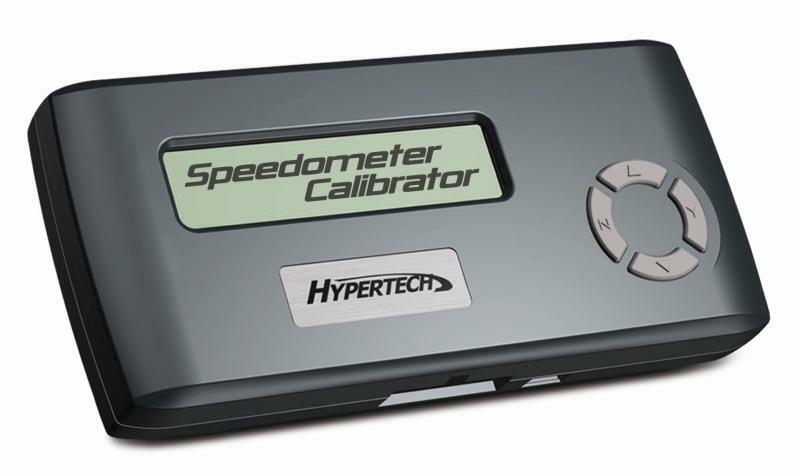 The Speedometer Calibrator also comes with a USB cable and a CD containing software to enable quick updates and upgrades over the internet. How does it work? Simply plug the Speedometer Calibrator programmer into the vehicle’s under-dash connector, select the tire height and new gear ratio, and in a matter of minutes, your vehicle’s computer is reprogrammed for accurate speedometer and odometer readings (as required by law). In addition, the Speedometer Calibrator reads and clears Diagnostic Trouble Codes (DTCs) or “check engine” lights. This allows you to view detailed information about your vehicle�s operation without having to purchase expensive diagnostic computers or scanners used by dealership technicians. All Hypertech products have a Money-Back, Satisfaction Guarantee!